You might have figured out by now that I am in love with the Japanese brand, Liz Lisa and was so excited when I came to Shanghai and found a shop at Jiu Guang mall. Recently though, the shop closed down and left me feeling more than a little sad. But I have good news! 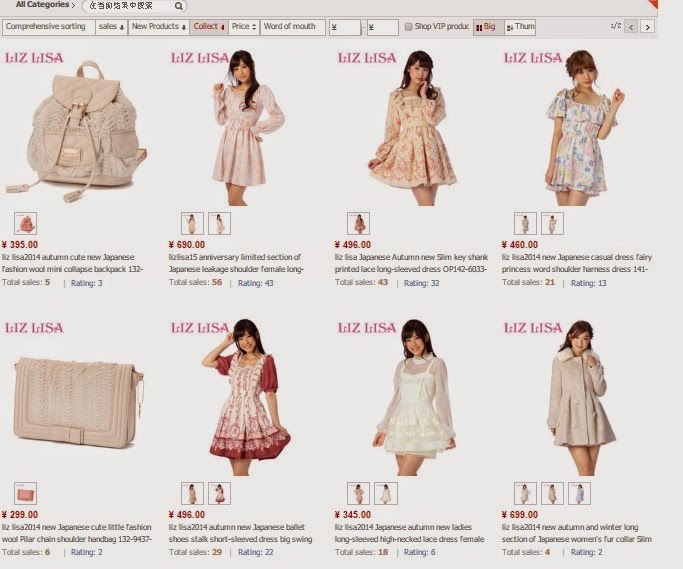 Liz Lisa has an officially licensed Tmall shop that ships all over China! The site features a wide range of their items including: New Products, Outer wear, Dresses, Tops, Bottoms, Shoes, Bags and a Sale page. Liz Lisa's Tmall shop confidently displays it's certification of authenticity. Currently, they are having 2 big events. In celebration of the unofficial Single's Day holiday, they will be having a three day sale with special discounts for spending a specific amount of money. And they are also offering three types of lucky packs: 499, 799, and 999 rmb. Each lucky pack comes with a mystery gift! I love and hate lucky packs, but decided to get the cheapest one and try my luck. Unlike the New Years lucky packs in Japan, the contents are not revealed at all! I'm crossing my finger that I'll get some great items and hopefully get the super cute Champouf as my mystery gift! Once it comes in, I'll make a post of the contents, so stay tuned!